Small belt conveyors for semi-rigid and flexible packages. Conveyor sizes range from 12” long x 4” wide belt, up to 30” long x 18” wide belt. All 304SS construction, seal-welded frames and supports for IP66 (4X) compliance. Offered as 1, 2, or 3 conveyors on a common framework, integrated metering/pacing and variety of reject styles available. 89 to 230VAC 50/60 Hz. Single Phase source power connection. 24VDC I/O. Timed outputs for reject and alarms. 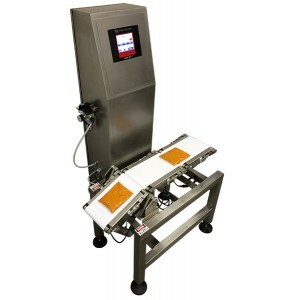 Integrated metal detectors offers minimal equipment foot print and seamless rejection operation with scale. Rates as high as 200 packages per minute. Accuracies as high as +/-1g @ 2 Sigma. Variety of capacities from 1 lbs. to 10 lbs.